Jamie Collins showed off his serious leaping ability against the Colts Sunday night. 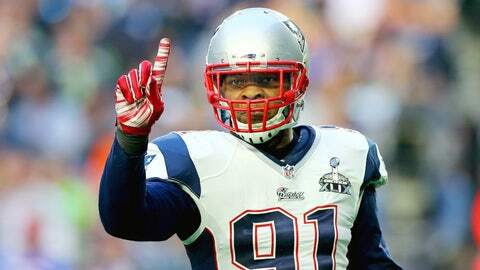 Jamie Collins has been called a freak several times, and not in a bad way. The New England Patriots linebacker is a freak of an athlete with ridiculous ability to make plays all over the field. He showed that off Sunday night against the Indianapolis Colts on this extra point attempt. Reminiscent of Kam Chancellor's hurdle in the playoffs last season, Collins hurdled the line and blocked former Patriots kicker Adam Vinatieri's extra point to bring the Colts within six. It was an insane showing of athletic ability on Collins' part, further solidifying his place as being one of the best defenders not only on the Patriots' roster, but in the NFL, as well. Here's what Bill Belichick had to say about the play after the game. Collins sure did make a great play on it, and while it didn't prove to be a pivotal play, it definitely could have had the Colts recovered the ensuing onside kick.